The team at Advanced Sports Logic (ASL) is passionate about fantasy sports. ASL endeavors to put the user experience first, making it easier and more fun to play fantasy sports. This means facilitating delivery of integrated content, player projections and tools from various quality sources with consistent and easy-to-access and use packaging. ASL aims to be a support to fantasy players and the industry alike, making it easier for smaller companies and individuals to their best work product directly to fantasy sports players so they can do what they are most passionate and skilled out without needing to be a mathematician, software developer or IT expert. Do you want a fantasy sports product to sell on your site? ASL’s Daily Fantasy Sports (DFS) Lineup Optimizer can be white-labelled on your site with your player projections (or ours). 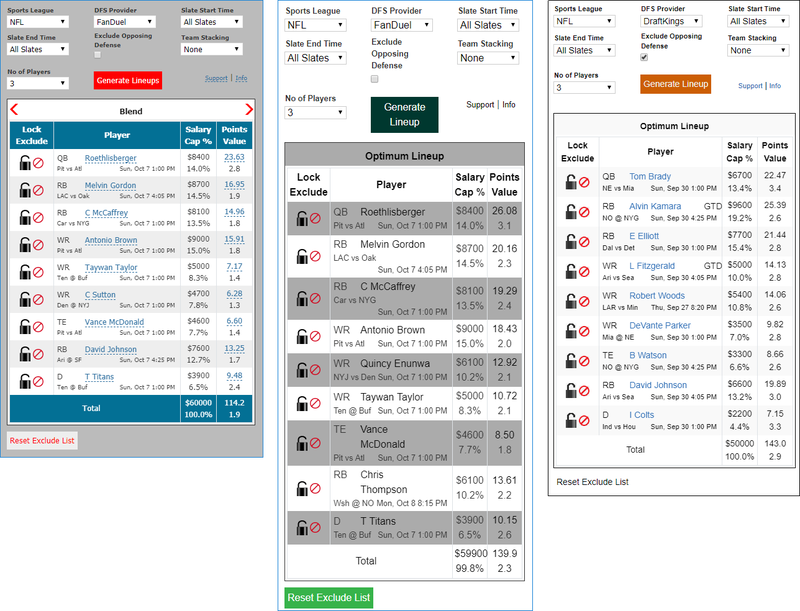 Our DFS Lineup Optimizer has a full set of features and powerful math. You can customize the user interface, including colors, fonts, to fit into your site’s themes. We offer flexible and affordable terms no matter how big or small your site is. We’ve done the hard work so all you have to do is add it to your site and start generating revenue. Do you produce Daily Fantasy Sports projections? We can sell your projections on our site as a bump-up to our Daily Fantasy Sports lineup optimizer. Rates vary depending on time of year and current demand.